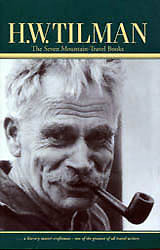 Harold William Tilman (1898-1977) was perhaps the greatest explorer-mountaineer of his time. His travels in Africa, Patagonia, the Himalaya and the most desolate regions of Southeast Asia, sometimes with his friend Eric Shipton, often alone, are near legendary. They are celebrated as much for their style as their difficulty, length and exploratory nature. Mountaineer, explorer, and sailor, born in Wallasey, Merseyside, NW England, UK. He made the first ascents of Midget Peak, Mt Kenya (1930), and Nanda Devi (1936), was a member of the 1935 Everest expedition, and led the 1938 attempt. After 1953 he sailed to Patagonia and crossed the ice-cap, and completed the circumnavigation of South America. He circumnavigated Africa (1957-8), and in 1977 sailed from Southampton to the South Shetland Is, but was never seen again after leaving Rio.